Museum collections are vulnerable to destruction from pests such as insects, rodents, birds and mold. This type of deterioration to collections is not always addressed because the damage is often gradual, obscured from general view, and therefore, unnoticed. However, over time this persistent activity can have devastating effects on museum collections. 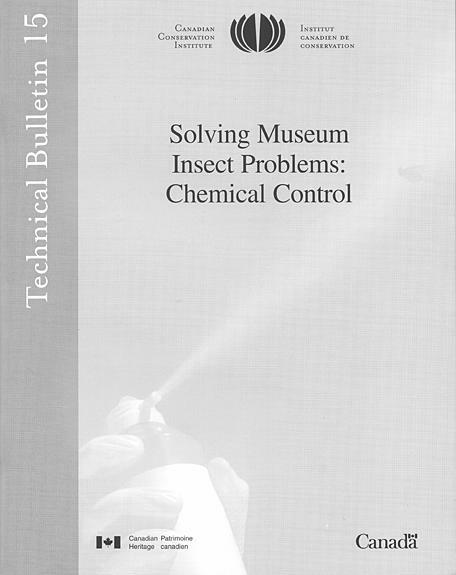 In the past, chemical applications were widely used in museums to eradicate pests. Recent changes in public attitudes and government regulations have increased the pressure to minimize the use of pesticides, and have encouraged the use of preventative measures and less toxic materials and methods. Integrated Pest Management (IPM) is the general term used for pest management programs in many museums and other institutions. 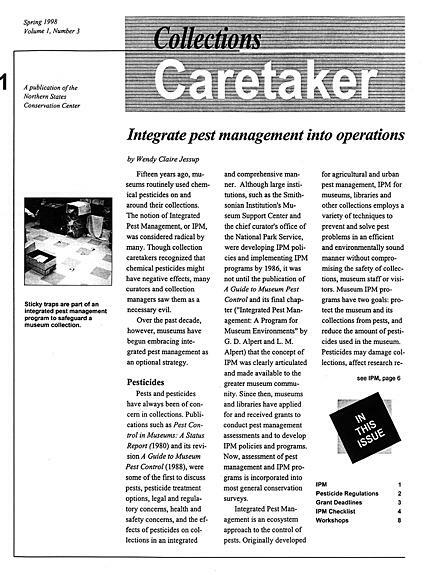 IPM focuses on preventive techniques to minimize food, moisture and environmental conditions required for pest survival. Sanitation is a crucial factor in pest control. A clean, uncluttered environment is not attractive to pests. The condition of the building itself is another important factor in pest control. Pests infiltrate through cracks and holes in building structures. It is important to seal openings in buildings to inhibit passage. 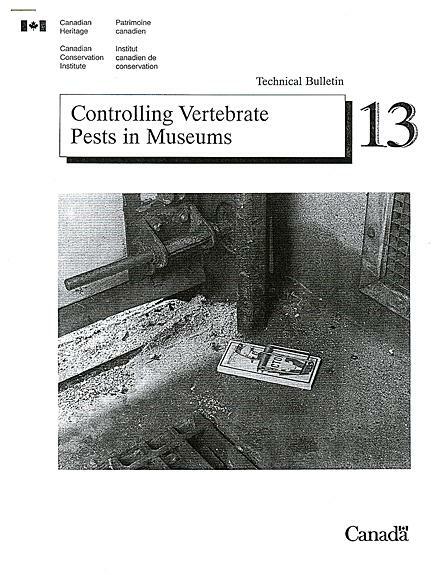 Pests are also brought into museums from the outside on objects and sometimes people. Containment of affected areas or objects is important in preventing infested materials from contaminating non-infested collections. Early detection is critical in pest management programs. Regular inspection of the museum environment and collections is necessary to control activities as they occur. Records should be kept for long term evaluation of changes. Examines the detrimental affect that rodents have on museum collections. Vertebrate animals can soil or destroy artifacts. Prompt identification of the pest and the use of suitable methods to control it are essential. In most cases, non-chemical methods can be used to control vertebrate pests in museums; chemical methods are also discussed. Pests can be very destructive to both aesthetic elements and the structural integrity of collections, historic buildings, and objects. Protection against pests requires attention to the collection’s environment, containment, discovery of pests, response to pests, and remediation actions. Reducing loss of value over time is the goal of preventive conservation strategies. Integrated pest management (IPM) practices are part of this process. Having a safe work environment and minimizing adverse effects to objects from chemical exposure is a background concern. Effectiveness of any control procedure or treatment can be measured by reducing the extent and repeated incidence of the problem. Basic pests of collections, and a structured approach to pest reduction activities, are presented. A survey method with remediation activities appropriate to pest infestation findings is given to help start an IPM program for a wide range of collections from outdoor installations to state-of-the art preservation facilities. Integrated Pest Management (IPM): What Is It?